The CircleNode creates height map values with the shape of a circle. Can be used to mask or mix areas of your height map. gradient with The width of a gradient. The gradient increases the radius of the circle. 0 for no gradient. gradient exponent The exponent of the gradient. 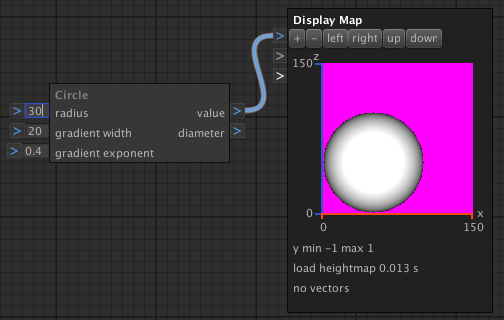 value Height map values with the shape of a circle. float.NaN for values that do not intersect the cycle. diameter The diameter of the circle.